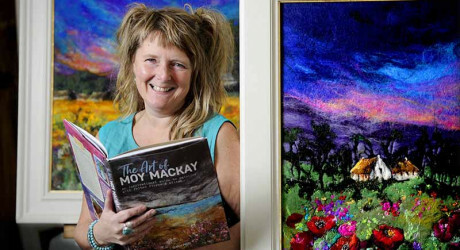 INTERNATIONALLY-renowned, Scottish felt painter and fibre artist, Moy Mackay, has just launched her third book: The Art of Moy Mackay. Moy’s latest book, launched at the weekend at The Haining in the Scottish Borders, comes in the wake of the success of her best-selling book, Art in Felt & Stitch, followed by Flowers in Felt & Stitch, which to date has sold well over 30,000 copies. Moy returned to Scotland just in time to launch her new book, fresh from a phenomenally successful, month-long tutoring tour of Canada. It seems highly likely that her latest publication will achieve equal success. Stunningly illustrated with her own famously colourful fibre paintings, Moy also fills the pages with inspiring ideas and clear instructions for professional artists and aspiring artists alike who may want to explore this unique medium for themselves. Fittingly, designer of The Great Tapestry of Scotland, Moy’s cousin, Andrew Crummy, opened her launch, saying: “It is an honour to introduce Moy Mackay and her new book. As the designer of The Great Tapestry of Scotland, I know through the many embroiderers I meet how they hold Moy and her warmth, craft and artistic skill in high regard. Speaking to a delighted crowd who braved ‘severe weather warnings’ of high winds, rain and flooding, to join her in this celebration of the launch of this, her third book, Moy reciprocated the honour, saying: “It also seemed fitting to have Andrew launch my book! “We both explore fibre-based art forms so I was certain that my guests here would be delighted to meet him. On graduating from Glasgow School of Art in 1990, I moved to a flat at The Haining, where I set up my first studio, working in an old stable block. It was from these humble beginnings in this idyllic country estate’s setting that my love of the Borders and particularly the Tweed, Ettrick and Yarrow Valleys began. The Haining Charitable Trust, along with many dedicated volunteers were equally delighted when during her launch, Moy gifted one of her new paintings to them as a gesture of thanks for all the inspiration she had received from this very special place, its people and its late owner. Lavishly illustrated throughout, with stunning examples of her own fine art, The Art of Moy Mackay encourages its readers to discover their own inner artist and to follow the detailed instructions and illustrations that will lead them to create their own works of art. Moy has just returned from a sell-out tutoring tour with Canada Felt Symposium 2018. She was selected to join seven other internationally-acclaimed felt artists from different corners of the globe, delivering and workshops and for over a 100 artists, some travelling from the widest reaches of Canada to ensure a place at her prestigious events. Colin Hattersley: www.colinhattersley.com 07974 957 388. Moy Mackay graduated from Glasgow School of Art in 1990 and is renowned for her pioneering ‘felted paintings’. She created her unique painting technique over 20 years ago when she set out to combine her love of textiles, colour and fibres in a more painterly way. Using merino fibres in the same way a painter uses brushstrokes, each vibrant vivid piece achieves a depth of warmth and texture paint cannot. By manipulating fibres in this way, Moy successfully bridges the gab between craft and fine art with her acclaimed works exhibited in galleries and private collections worldwide. From her home in the Scottish Borders, she fuels her passion for colour and texture with an unceasing inspiration drawn from her surroundings in the beautiful Tweed Valley. Andrew Crummy trained as an illustrator at Duncan of Jordanstone college of Art. He has since worked for New Musical Express, The Observer Magazine, Design Week, Creative Review, and Time Out Magazine. He has developed multiple large scale, collaborative artworks in public and community settings across the world, and has been involved with a range of book publications, multimedia events, festivals and educational programmes. In 2005, he was chair of the Craigmillar Communiversity when they were awarded the Saltire Award for a Short Scottish Documentary at the Edinburgh International Film Festival. Most recently Andrew, in addition to his role as Convenor of the Prestongrange Arts Festival, was the principal artist and illustrator of the Prestonpans tapestry. Andrew is the artist and designer for the Great Tapestry of Scotland project. MEDIA RELEASE issued by Carol Carr PR. You too can share your stories (aka press or media releases), on this site. Email here for more information.